Getting ready to purchase tires for your car? Great! This tire-buying guide will give you all the information you need to purchase the right tires for your car and your lifestyle. From determining the right time to buy new tires, to making sure you pick the right size and type for your vehicle; the WorldOfTires.org Buying Guide has you covered. Learn how to identify damaged or worn tires. A worn or damaged tire is unsafe and can cause your vehicle to lose control in inclimate weather or bust in hot conditions. Make sure you check your tires often and learn what to look for to ensure safe driving conditions. Find out how many tires you should stock up on to keep your vehicle running safely and smoothly on the road. Most vehicles have four wheels and it is highly recommended that you replace all tires to get even wear and while maintaining tire safety. From pick-up trucks to economy cars, learn how to choose the appropriate size tire for your vehicle. Also check out our tire size calculator to find the right tire size and the differences in changing sizes for your vehicle. Determine the best set of tires for your environment and the roads you travel the most. Check out the various types of tires we carry including: all season, winter, all terrain, mud terrain and more. You have not driven on the damaged tire while it is flat. Finally, if the puncture is less than a ¼ inch. If you feel your tire exhibits any of these conditions, contact your local auto service center immediately. They can tell you if your tire can be repaired or needs to be replaced. Remember, worn tires are not only unsafe to drive on; they are against the law. Legally the minimum tire tread depth is 2/32 inch. When the road is wet, 4/32 or less tread can mean a high risk of significant loss in wet traction. In other words, hydroplaning, which can put both the passenger and you at risk. 1. 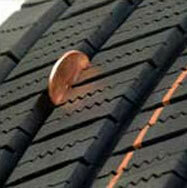 Penny Test To test to see if your tread has been worn out, place a penny into the most shallow tread groove with Lincoln’s head facing down. If the top of his head is still visible, then the tire needs to be replaced. 2. 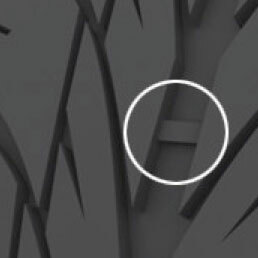 Look for the wear bars The wear bars are the narrow bands that appear in the grooves across the tread of the tire. When the wear bars are even with the depth of the tread, that means that only 2/32-inch of tread is remaining. If you are able to see the wear bars, then you tire needs to be replaced. Once you have determined that your tires are in need of replacement you can now figure out how many tires to replace. Most people replace tires in sets of 2 or 4. But it is possible for you to replace 1 tire (if you have a flat) or 3 tires as well. You are going to want to find an exact match for the damaged or worn tire. That means you want to replace it with the exact brand, model, speed rating and load capacity. (Information about these items is in the next section) If you use a different tire than what was previously on there, you put your vehicle at risk for poor handling, pulling and instability. You are going to want to replace with the same or better-quality tire. It is suggested that you buy two of the same tires when replacing. That way they should wear evenly and perform in line with one another. It is also suggested that you mount the new tires on the rear of the car (if rear wheel drive) or front of your car (if front wheel drive), and move the older tires to the front/rear of the car. This is because the newer tires have a deeper tread which helps with hydroplaning resistance so they can grip the road better than your older tires. You can then steer to compensate for the lower wet traction worn front tires to safely control your vehicle. When replacing 3 tires, you will want to follow the same rules as replacing two tires. You will want to put the two newer tires in the back and move the older tire to the front. It is best to keep the rear tires the same and the front tires the same. So when replacing three, you want to make sure the two in the rear are the same tire, and that the new one up front is the same as the older tire that is currently on the vehicle. However, if there isn’t much tread life left on the one older tire, it would be best just to replace all four at that point. HOW DO I PICK THE RIGHT TIRE SIZE? You can determine the right size tire two different ways. You can search by your vehicle by entering in the year, make, and model in the vehicle and tire size search. Or you can determine your tire size by looking in your vehicle’s owner manual, on the inside of the vehicles door well, or analyzing the sidewall of your tire. Check out our tire size calculator to see the differences in speed and efficiency that changing your tire size will make. We also sort tires by vehicle so you can find the right tire for your car or truck in our vehicle tire area. Analyzing the sidewall can be tricky. But if you follow this guide, we will have you determining you tire size in no time! The P on the sidewall indicates it’s a passenger or performance tire. An “LT” indicates that it’s a light-truck tire. Width is the distance between the outer edge and the inner edge of the tread of a tire. This determines how tall your tire is. The bigger the number, the taller the tire. Typically, higher performance tires have a lower aspect ratio. Most all-season passenger tires have a ratio between 65-80. The “R” determines that it is a radial tire. Sometimes in higher performance tires it may have a VR or ZR. That just means it’s a V or Z speed rated radial tire. This is the diameter of the inner hole in the tire. This is basically the rim size this tire can fit on. Hence a 14 means it fits on a 14-inch rim. Load rating refers to how much weight a tire can carry. A load rating of 82 indicates that a tire can support 1047 lbs. You will then multiply that number by four to determine the maximum carrying capacity of your tires. It is not a good idea to install tires with a lower load rating than what originally came on your vehicle. You can reference the chart below to find the amount of weight your tire can carry. Each tire is issued a tire speed rating based on how well it reaches and sustains a certain speed. The higher the speed rating means the tire will provide better handling. It is best not to downgrade the speed rating of your tire and never mix different speed ratings on your vehicle. Both of these issues can lead to serious handling problems. Please reference the chart before to find your tire’s speed rating. After you have determined how many tires you need and your correct tire size it’s now time to figure out what kind of conditions you are most likely to encounter when you drive. Do you drive a lot in the rain or snow? Do you drive truck on-or-off roads? Do you mostly drive in dry weather? All of these conditions are factors when choosing the right tire for your needs. What you want to do is analyze your driving conditions. You want to think of your worst possible driving conditions and balance them out with your typical driving conditions. If you use more than one set of tires and wheels; for example summer tires for summer and snow tires for the winter, you can select tires that will exactly meet your needs. However, if you use just one set for every season, you may get great performance under certain conditions but comprise on performance during other conditions. So it is important for you to match your tires based on the worse possible conditions you may expect to encounter. If most of your driving is around town, almost any tire will work for you. But, if you drive a lot on congested city streets or expressways during rush hour, you may want to get a tire that is more responsive and has better braking abilities. If you really only drive on interstates, than you will probably want a quiet, smooth-riding, long-wearing tire. If you drive on winding roads, you want to look for a better handling tire. If both conditions seem very similar, one set of tires is all you need. If you infrequently encounter snowy or hazardous conditions, you may want to select an all-season tire. If your worse conditions appear more frequently you may want to consider two sets of tires. What you want to do first, is indentify the kind of vehicle you are buying tires for. Or if you are in need of winter tires. Then you will want to choose a tire that best suits your needs. These tires typically have taller sidewalls and emphasize benefits such as long-tread life, comfort, and dependability in a variety of weather conditions. Some of these tires are speed rated. Usually they range from S (up to 112mph) to T (up to 118mph). What you will want to do is compare the speed ratings to what is most important to your driving conditions. Remember the higher the speed rating, the better performance and handling a tire has. Passenger tires are the most cost-effective tires available. They have all the main attributes one could look for in a tire; smooth ride, long wear, low noise, etc. However if you are looking for something a little better, but still not as pricey as a sport/luxury car tire, you can opt for a Touring Tire. These tires offer enhanced performance combined with excellent ride quality. They usually have a slightly lower profile and wider tread than an equivalent passenger tire, which helps the Touring Tire to handle and perform better at higher speeds. These tires are designed to provide confident handling and stability at higher speeds to maximize performance of sport/luxury cars where handling is very important. These tires are often used to enhance the look of just about any vehicle. They are available in lower profiles, larger wheel sizes, wider treads and stiffer sidewalls to improve cornering response and stability. Tires in this category are most like classified as performance, high-performance and ultra high-performance tires. All these tires are speed rated. They typically range from H (up to 130mph) to Z (up to 149mph). Remember, ultra high-performance tires must be matched with ultra high-performance vehicle suspensions in order for you to appreciate the benefit of the tire. These tires are usually the priciest of all tires. These tires usually have a higher load capacity than other tires. Load capacity is controlled by how much air is in the tire, and at what pressure. Tire sizes that begin with a “P” (Passenger) are meant to operate at lower pressures and loads than that of the same size that begins with “LT” (Light Truck). The “P” will have a better ride, but the “LT” will be able to haul a larger load. The best way to decide which SUV/Truck tire you need is to figure out what you plan on driving on the most: on-highway, on/off highway (all-terrain) and off-highway (off road). On-highway tires have more of a rib tread design and off-highway tires have more of an aggressive blocky or chucky tread design. Make sure you pay attention to load index and speed rating when you choose the tire the best suits your needs. These tires come factory installed on many of today’s vehicles due to their smooth highway ride and good all-season traction. These tires offer sport car handling for trucks and SUVs, yet can handle the suspensions and load-carrying capacities of trucks. The all-season tread emphasize street handling and traction year-round. This is a step up in off-road traction compared to all-purpose tires. Most drivers are willing to accept the worse performance on highways in order to get the additional traction. The days of studded winter tires seem to be over. So if you drive in wintery conditions, you will want a tire that can handle a wide range of winter conditions such as snow, ice, slush, rain to freezing rain, and of course dry highways. Winter tires utilize tread compounds that remain soft and pliable in the cold for reliable snow and ice traction without the need for studs. Please remember that winter tires should be purchased in sets of four. So that about does it. We covered when you need to get new tires, how many tires to purchase, understanding tire sizes, and how to pick a tire for your specific driving conditions. Hopefully we made the process Simple enough for you. You can find some more information about tires in the World of Tires blog. However, if you are ready, go ahead and buy yourself some sweet new tires!